This was my second time running in a Fort For Fitness event and it was Mark’s first. 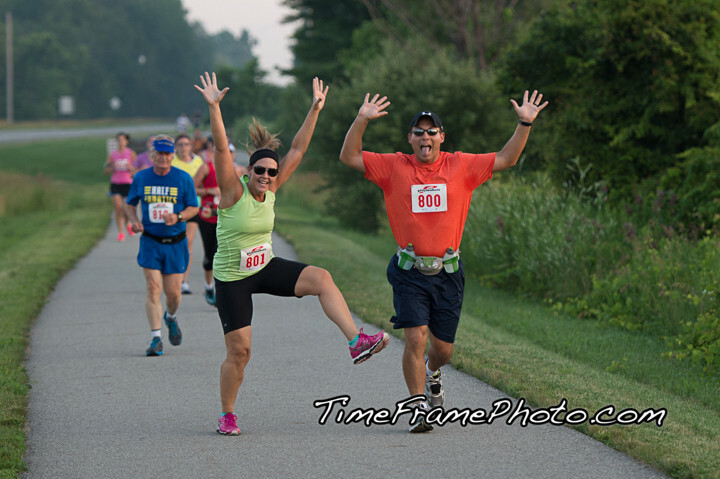 This race is so well organized, is a beautiful route through Fort Wayne, and overall it is one of the most enjoyable races we run each year. Plus, as a bonus they have incredibly cool medals for all of their race distances! I was originally signed up to run the half marathon; however, due to some health issues I had been experiencing I decided that I was going to drop down to running the 10k — as did my Mom. 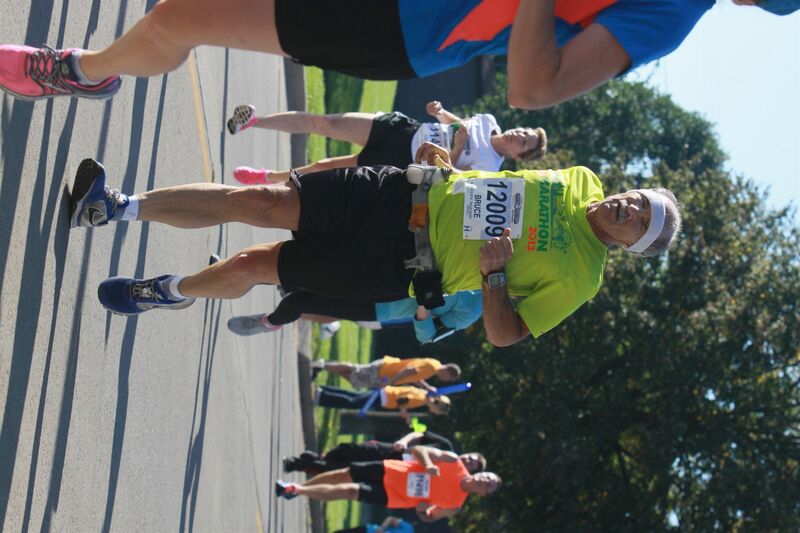 Mark and my Dad both stuck with running the half marathon. It started out as a cool morning as we waited for the race(s) to start. Mark and Dad started before us. After watching them start we ran back into the stadium to watch my Aunt Peggy and Aunt Mary finish their 4 mile race they were running in. After seeing them cross the finish line Mom and I dropped our bags off at the gear check table and then took off for the starting gate. Mom, Lisa Mouatt and myself before the start of the 10k race. Our plan was to stick together throughout the race; however, when running with over 1,800 other runners that can be incredibly hard to actually do. The starting gun went off and slowly but surely everyone took off from the starting corals. Mom and I were able to run the first 1/4 mile together until the route turned a corner and then we lost each other. 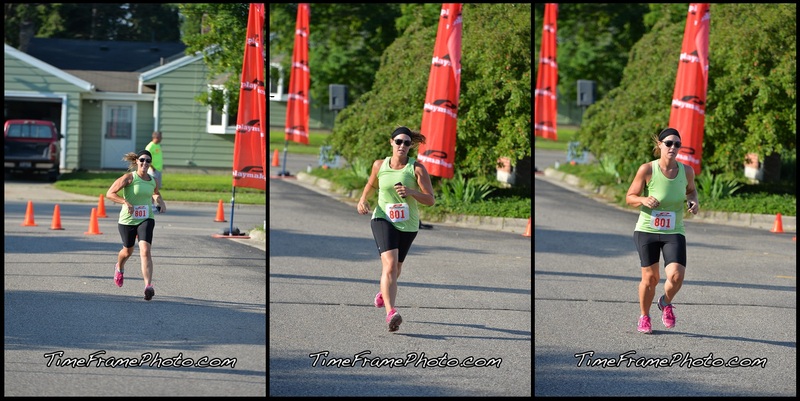 This was my first race where I ran alone and music free — and I have mixed feelings on how I liked it. Part of me really enjoyed listening to my feet hit the pavement; however, there was a big part of me that wished I had my tunes to listen too. Music is such a big motivation for me when running and there are times, specially during a race, where that motivation is really needed and helpful! The first few miles went by quick and I felt great. My goal was to finish before the 1:20:00 mark. I know, I know — you are probably thinking 1:20:00 for a 10k, holy crap that is slow — and it is. However, like I said I was experiencing some health issues so that was a realistic goal. Around the 3-4 mile markers the half marathon course and the 10k course come together and everyone runs the last 2-3 miles together. I knew I was moving at a pretty good pace when I got to the point where the courses came together and my Dad was only 10 yards ahead of me on the half marathon course. I continued to buckle down and plug along. A 3/4 of a mile from the finish line I turned a corner and I saw Mark ahead of me — about 50-75 yards ahead of me. Using what energy I had left I yelled out his name as loudly as I could once. Luckily he heard me, turned around, noticed me, smiled and waved! I knew he wasn’t going to slow down to let me catch up to him, so I gave a little burst of energy and tried to catch up to him. Oh boy, was that a mistake!! My legs were already tired and that just took about every bit of energy/leg strength I had left in me. I pushed through the last 3/4 of a mile and when I rounded the corner and headed down onto the out field I just kept telling myself — almost there, almost there, almost there. The more I have run the more I have learned — if you have enough energy and strength left to really sprint as fast as you can to the finish then you haven’t ran hard enough throughout the race. Well, for me that saying was true! 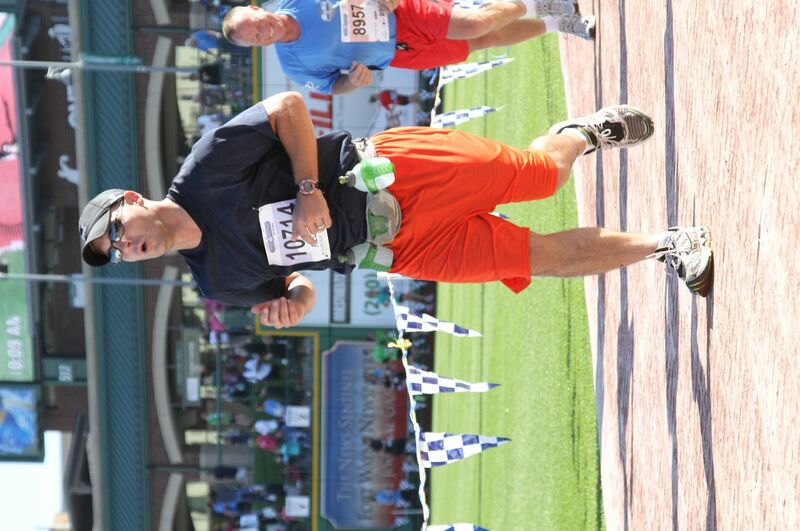 I only had enough left in me to cross the finish line running but there is no way I had anything left to sprint. Meghan finishing the Fort For Fitness 10k. Mark had finished 5 minutes before me and he was waiting at the back of the finish line for me. I was so happy to see him — I ran up and jumped into his arms giving him a huge hug and kiss. Mark finishing the Fort For Fitness Half Marathon. I was so proud of myself for finishing 10 minutes under my goal time and I was so proud of Mark for running his second half marathon in under 60 minutes!! After we finished hugging we got our finishers medals, went through the food tent and took off to have our finishers photo taken. 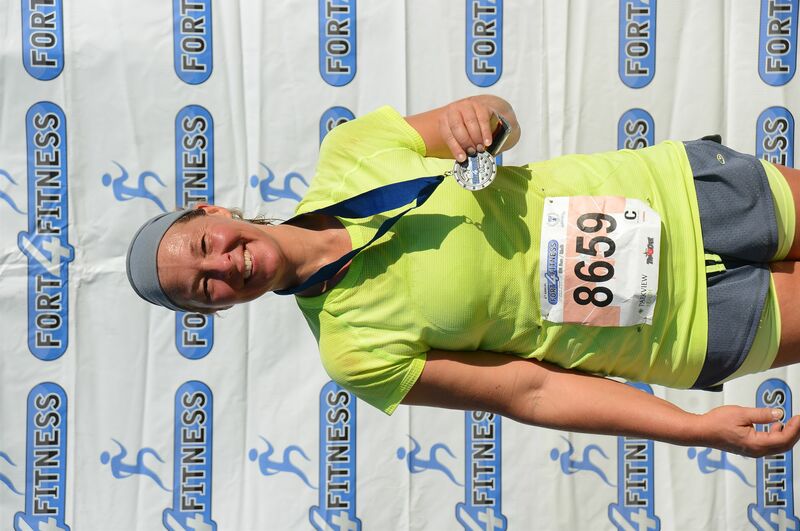 Our finishers photo from the Fort For Fitness races. After that we went to find Mom, Dad, and everyone else in the family who there running/supporting. Overall it was another great race and one that Mark and I will probably run again next year! And just on a side note — here are photos of Mom and Dad! Dad with about 1.5-2 miles left to go in the Half Marathon. 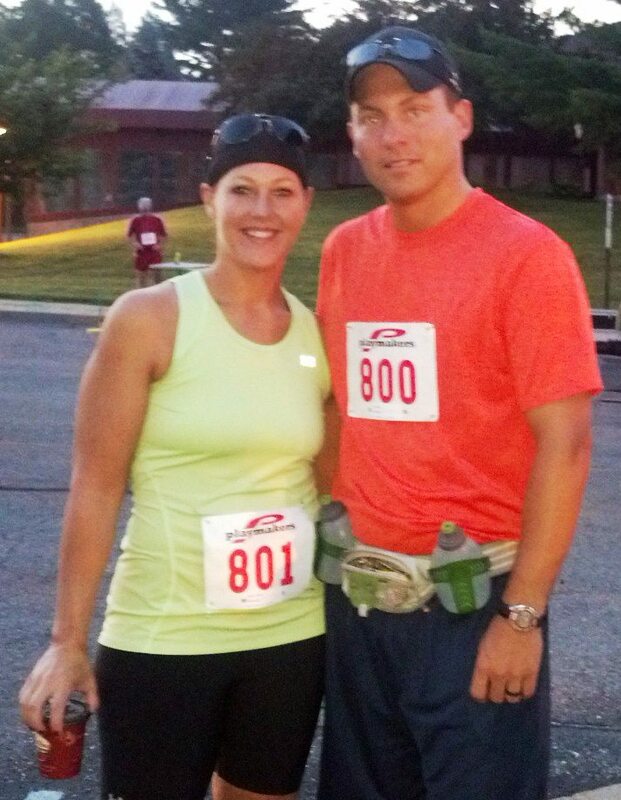 This was our first time running in the Duo of the Ledges Half Marathon. Unlike most races we enter now-a-days, which have to have an awesome tech shirt and medals — we picked this race based solely on it’s location. As you fellow runners know, racing is not a cheap sport by any means. Sure it is free to head out each day on the sidewalks and open roads for your practice runs; however, once you start figuring in the cost of running shoes, clothes, race entry fees and travel expenses it can add up quickly. Specially when both you and your better half run, which means most of the expenses are doubled. Since we needed a half marathon to fit into our training and this was the closest half marathon — this is the one we picked. Our race bibs and the tech shirt we got with our race entries. Mark and I headed over to Playmakers in Okemos on Friday to pick-up everyone’s packets. 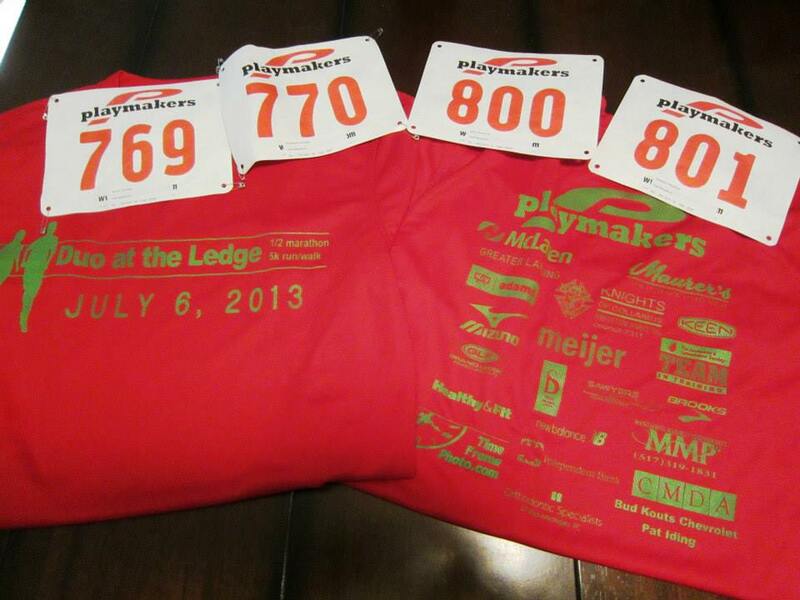 (As always, Playmakers does an amazing job with their packet pick-up process.) That evening Mark and I tried to spend the relaxing and headed to bed around 9:45 pm, knowing that we were going to have a super early morning. On Saturday we woke up to our alarm going off at 4:15 am — UGH, yes, that’s right — 4:15 am!!! We got ready, had some breakfast and headed out the door towards Grand Ledge, which is about 30 minutes away from Mason. When we arrived at Grand Ledge High School it was still pretty dark and none of the parking lot lights were on (bummer). It was a little bit of a cluster trying to get my running shoes on, our bibs pinned, and our race belt all ready to go in the dark but we managed. Mom and Dad met us right there at the high school and also finished getting ready. After we were all set we took off towards the starting line to find the restrooms and gear check our one bag we were all sharing. (Yes, a race with 200 people had a gear check and it was awesome!) The line for the bathrooms wasn’t very long so I decided to wait and make sure I was going to start the race with an empty bladder. After all four of us hit the bathrooms and checked our bag we began to stretch and get ready for the start. Mark and I before the race. 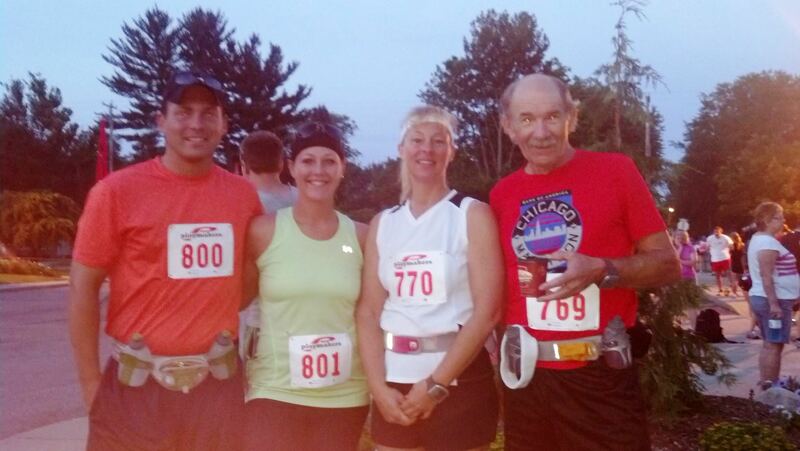 Mark, myself, Mom and Dad before the start of the race. 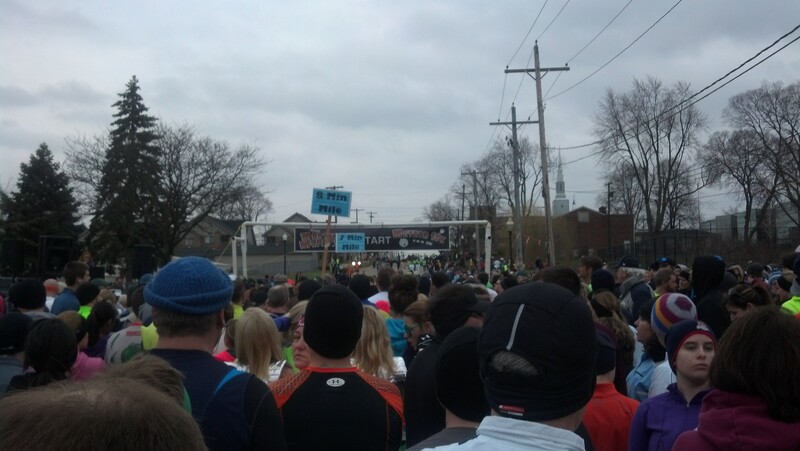 The race started out on one of the side street in downtown Grand Ledge and was just a “gun” start. For being a half marathon this is one of the smallest races I have ever ran in — including all the 5k’s I have done. With only 206 runners it was a pretty small field and even with a gun start everyone was able to make it across the “starting line” within 10-15 seconds of the “ready, set go!” we got! The pack took off from the starting line and 200 yards in I had to remind Mark that we needed to set our own pace and not run with the pack. I could feel that we were running a tad faster than our goal pace and knowing we had 13 miles left ahead of us I knew we needed to slow down or we would be in trouble towards the end of the race. Miles 1 and 2 went great. We ran a 10:10 and a 9:45 mile (respectively) and then came the first water station a little bit past the 2 mile marker. For the first time ever that I remember I broke one of the cardinal rules of drinking water while running. Instead of slowing sipping, I downed the entire small dixie cup of water in one big gulp. I am not sure if that was the cause of my issues for the next 5 miles or if it were something else, but the next 5 miles were the wort 5 miles of my life! Mark and I at mile 2. I literally felt like I was dying as I ran miles 2-8. It felt like my stomach was being twisted over and over again, while a boxer was constantly slugging away it at the same time. 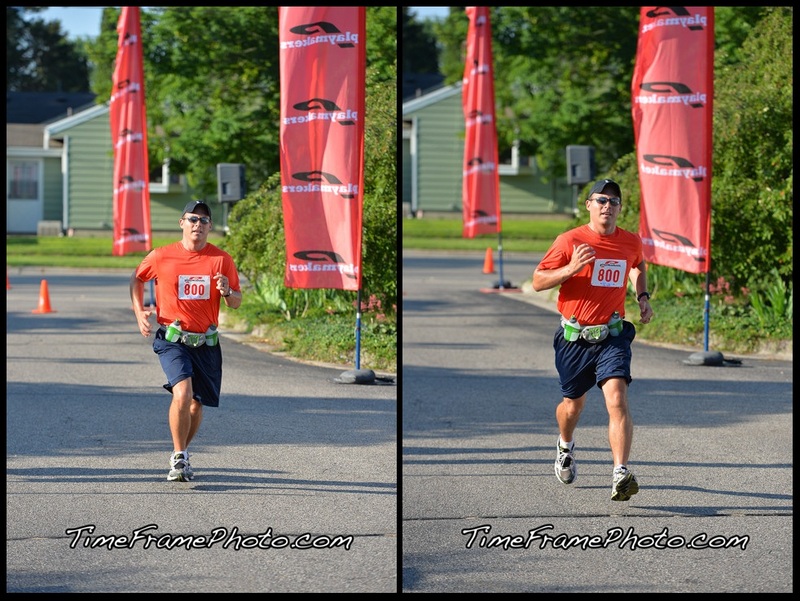 I was able to push through the pain for miles 2 through 5; however, around mile 6 it really started to take a toll on me. Around 6.5 miles I asked Mark for my package of Chomps and forced myself to down at least 3/4 of them along with a few small sips of water. Within minutes I felt like that had been a horrible decision and my stomach pain got worse. After we hit the 7 mile marker I could no longer physically run. It hurt — and I mean — it hurt! I finally looked at Mark, asked him for the cell phone from the race belt in case I needed to call for help and told him to go ahead without me. As much as I love running our races together — I felt horrible about holding him back that badly and knew I wanted him to finish better than I would. My loving husband gave me this look like I was crazy for wanting him to leave me in that condition, but I promised I would be okay and told him again to go. He gave me a quick kiss, told me he would see me at the finish line and took off running. I pushed myself through mile 7 which felt like death. At this point I had been pasted by three younger runners, a very elderly gentlemen who was doing a run-walk, and a very elderly lady also doing a run-walk. Finally I decided that the next time I saw a race worker I was going to ask if they could get me a ride back to the starting line and I was going to take my first DNF (Did Not Finish) ever. It was a relieving feeling knowing that I was making the right decision to pull myself from the race as I knew something was not right. At this point I had been pasted by three younger runners, a very elderly gentlemen who was doing a run-walk, and a very elderly lady also doing a run-walk. Then came mile 8. As I passed the 8 mile marker my stomach pain suddenly started to subside quickly. I decided to try my hand at running to see if the pain came back and took off in a slow jog. Not only did the pain not come back it continued to quickly subside. The relief felt amazing and I was able to seriously pick-up my pace. Over the next two miles I passed every single person who had passed me while I walked, plus a few more. I ran miles 8 through 11 with an average pace of 10:05 miles! Heck yes!!!!!! Miles 12 through 13 I ran a little slower because I began to have massive pain in my right knee. At that point I was not going to let anything stand between me and the finish — anything!!!! I rounded the corner downtown Grand Ledge and saw the finish line in sight. I could hear the theme song to “Rocky” booming from the announcers booth, which just happens to be one of my favorite running songs of all times and I took off as quickly as my legs would take me towards the finish line. Hearing my name and hometown called as I ran down the finisher’s shoot was one of the greatest sounds I could hear! I crossed the finished line and within 5 feet gave my Mom a high-five and a hug as her and my Dad were standing right there waiting for me to finish. A volunteer handed me my finisher’s medal along with two bottles of water and I began to look around for Mark. Unfortunately, Mark did not get to see me finish. He finished 8 minutes before me and had headed into the building for some food and water thinking he had about an hour before I would cross the finish line. Little did he know just how tough his wife really was and how hard she could physically push herself! The instant I saw him, we gave each other a massive hug and he told me how proud he was of me! 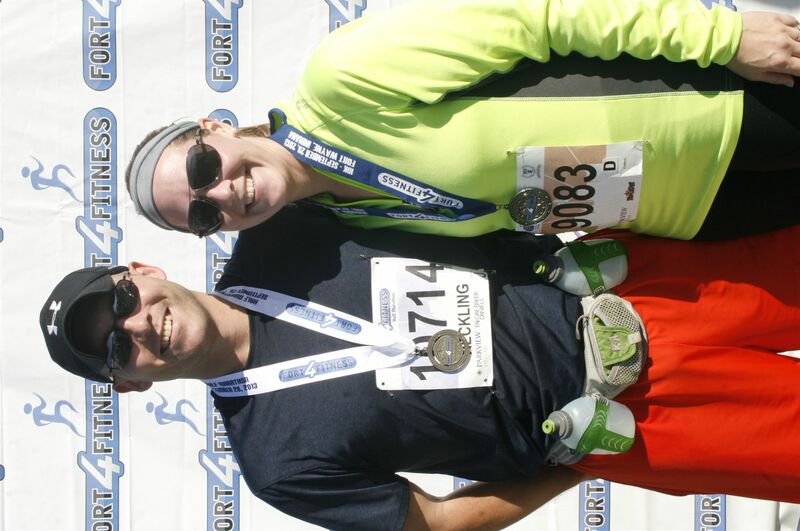 I think I was more proud of him though, as that was his very first half marathon. 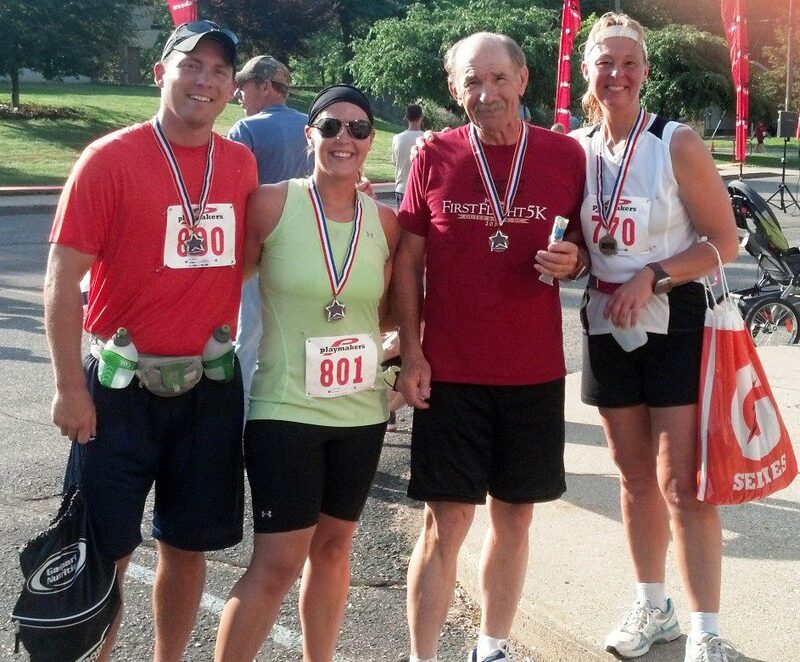 Mark, myself, Dad and Mom after we all finished! The race volunteers this morning were all amazing. All 100+ of them! The race organizers had more than enough water and food pre-race and post-race for all the runners. For a half marathon the medals were lacking compared to most other races, but overall it was a good race and I am glad we ran it. It is not a race that we will make sure is on next year’s list of “must run races”; however, in the future if we are ever looking for another close (and cheap) half marathon this is one we would do again! Like I said above Mark and I rolled out of bed at 4:30 a.m., got dressed, fed the dogs, grabbed our gear and headed out the door towards my parent’s house. We got to Howell around 5:30 a.m. finished getting ready and headed out the door for our hour drive to Dearborn. Although the 10k didn’t start until 8:00 a.m. we planned on getting down there at 6:45 a.m. because we knew parking was going to be hard to find. Luckily we were able to find a parking spot about 200 yards away from the starting/finish line!! Once we got parked we took off down towards the starting line to figure out the lay of the land and find the bathrooms! Getting there early meant we did not have to wait in line for the port-o-potties and there was still toilet paper in them! Bonus!! Tip for newer racers: Get there early on race morning! It will help with parking, allow you to check out the starting and finish shoots and use the bathrooms without having to wait in long lines! 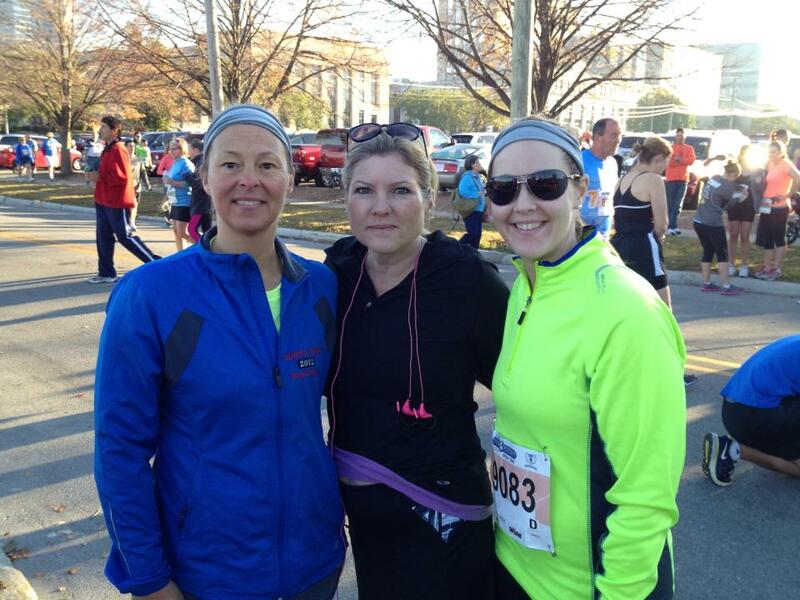 There were at least four different races that morning — the 5k, 10k, half marathon and a full marathon. That does not include a “Kids Run” that was starting as we were leaving! 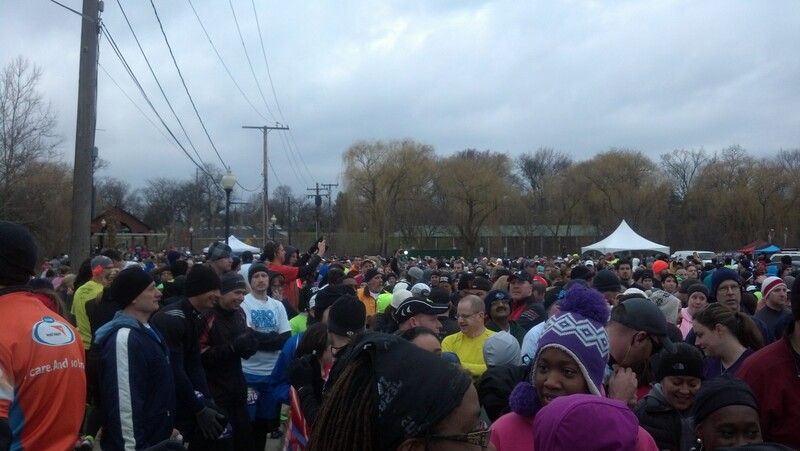 This is one of the largest “local” races I have ever been too; and it was very well run and organized. Tip for runners interested in running a future Martian Invasion: We picked up our packets during the expo the day before the race. Although we did not have to wait in line for packet pick-up on race morning, the line was insanely (and I mean INSANELY) long! Do yourself a favor and try to go the day before to get your packet or allow yourself a lot of additional time in the morning to wait in line. A “backwards” view of the 10k/5k starting gate, along with the line for packet pickup along the left had side of the photo. I was hoping since it was mid-April that we would have a nice spring time run, but boy was I wrong! It was about 38 degrees and incredibly windy all morning. As we were waiting for the race to start a nice lady and her husband took a picture of all of us together for me, then we all scattered to our appropriate areas of the starting gate. 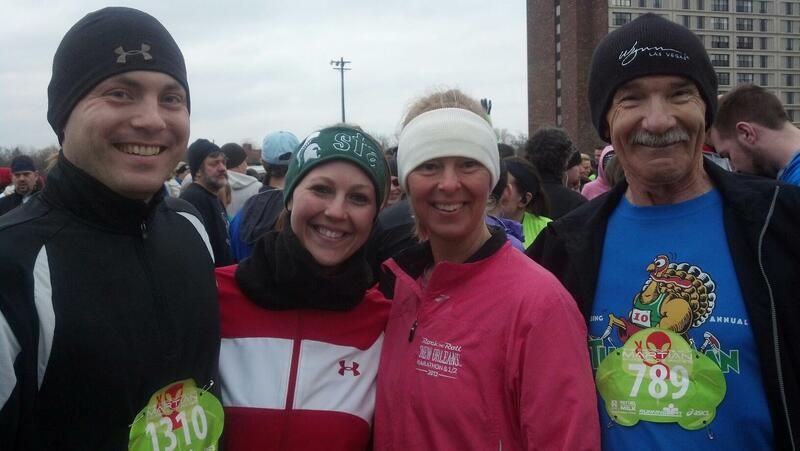 Mark, Myself, Betsy (my Mom) and Bruce (my Dad) at the starting line! The starting gun went off and everyone took that initial running leap forward till you have to stop again. The starting gate was setup on a three lane street and although the starting gate was good sized, after the gate the shoot was too narrow for the large amount of runners in the 10k (1,698) plus we started with the 5k runners so there were over 1,800 starting at once. Not only that, right after the starting shoot ended, there were onlookers who were standing in the middle of the running lane! The course was BEAUTIFUL and I really enjoyed running this race. The first mile was my normal “semi-rough” while I worked on finding my breath and my rythem. At the start of the second mile we ran around the Deaborn County Club Golf Course, then we continued onto a running trail which took us around Henry Ford Community College and The University of Michigan Dearborn. There was a fantastic mix of flat and easy running along with a few gradual hills which were a nice challenge. There were two bridges over Rouge River that we had to cross over and both times I had to stop and walk across them. The first bridge I tried running across, but with the large number of runners the bridge was bobbing up and down to the point where I got dizzy and almost fell over. So once I got to the second bridge I didn’t even try to run across it and just walked. All was going well until the 5.5 mile marker when the course took us up a nice little hill, out of the park and onto Michigan Ave. Since we had been running on a trail through the park we had not felt the effects of the gusting winds all morning. Once we came out onto Michigan Ave. we were no longer covered by the trees, completely exposed to the wind — and let me tell you what, it was COLD! That wind just cut right through you and took my breath away. It only lasted for a half of mile until we turned the corner a headed down the second to last stretch. Finally, we turned the corner and headed down the remaining few hundred yards the finish line. The finish shoot was cut in half and well marked on which side was for the 5k finishers and which side was for the 10k finishers. I tried to pickup some speed for the last 200 yards, but the crowd was pushing out into the finishers shoot and you could barely fit two runners side by side for the last 50 feet of the race. It was extremely frustrating for the finshers shoot to narrow so much — and it was purely a result from the on lookers pushing themselves out into the lane to get a better view! Tip: Keep in mind if you are watching for a friend or family member at the finish line respect the other runners who are running in the event! Do not crowd out into the finish lane! 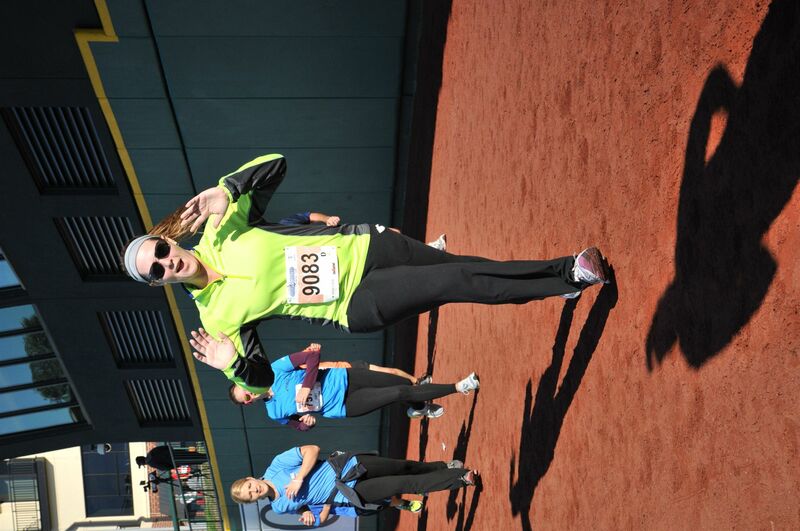 Do not run across the finish lane to the other side in front of runners who are coming in to finish! It is rude and extremely disrespectful! These people just ran for miles, some could be trying to obtain personal records, for some this could be their race of that distance and this is their moment! They have worked hard for it and they shouldn’t have to fit through the crowd to get there! As I crossed the finished line I stopped by GPS, looked down and knew I had I done it — A NEW PR!!! I was so excited! Not only did I PR, but I cut my time by 5 minutes!!!!! Mark is a little bit disappointed because as of right now he does not have an official finish time. His chip did not read him crossing the finish line; however, he did have his time according to his GPS watch and he also ran a new PR by about 4 minutes!! I am so proud of him! (We have emailed the race director and they are going to be working with us on getting Mark an official race time!) Tip for newer runners: Timing chips are tiny electronics! They do not always work perfectly. This same thing happened to my Mom during the 2012 Fort For Fitness 10k. If this happens to you — try not to disappointed. Email the race director with all of your information (name, age, bib number) and your approximate finish time. 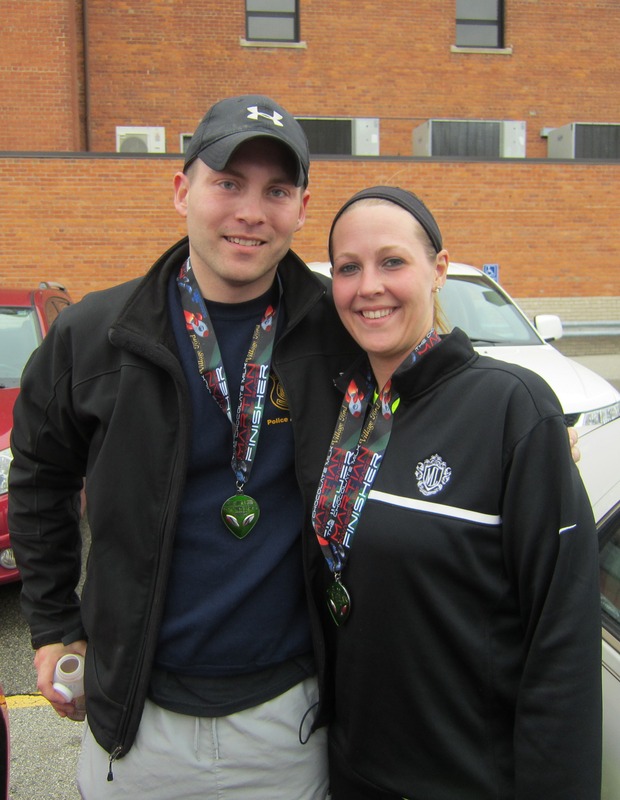 They should be able to help get you an official finish time by looking through their finisher photos! Mark and I after the race! The post race tent was full of chocolate milk, water, bagels, bananas, cookies, and other goodies — and there were plenty of everything for every runner! That was great! I grabbed the goodies I wanted and headed back to the car to change my clothes and stretch. Last race since it was so cold out I did not take my time and stretch enough — and although it was cold out I made sure I took my time and stretched properly! I am glad I did because the next day my legs felt great! My Achilles is still bothering me but I spent a few hours at home after the race icing it which has really helped! I have been struggling with that for three weeks now so I am following my training plan without pushing myself to hard, laying off the speed training and ice, ice, icing it! Overall it was an amazing race and now it’s time to start training for my next race — the 2013 Mason State Bank 5k, and nice run through my hometown!